New mobile app lets users explore the history of the city's LGBT community. 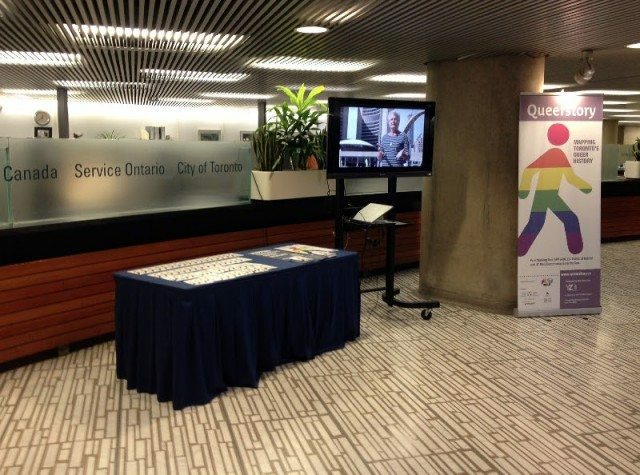 Queerstory’s display in the City Hall rotunda. Photo courtesy of Year One Zero. Take a stroll through Toronto’s queer history with Queerstory, a free mobile app that’s come out just in time for WorldPride. The app, produced by the non-profit media arts group Year Zero One, takes users on a self-directed walking tour of 30 sites that have played a significant role in the social and political history of Toronto’s queer community over the past hundred years. It also includes 47 mini documentaries and “media artworks”—including excerpts from documentaries by queer Canadian filmmakers such as David Adkin and Lynne Fernie—that illustrate the importance of those sites. At two stops on the tour, artists Keith Cole and Caitlin Fisher offer their interpretations of queer history. Queerstory will have a WorldPride display at City Hall until June 30, as well as a booth at the WorldPride street fair in Church-Wellesley Village until the 29th. The app itself is currently available for Android devices, and according to the Queerstory website, it will soon be on the Apple Store’s virtual shelves. CORRECTION: June 28, 2014, 9:50 AM This post originally miscalled the producer of Queerstory “Year One Zero,” when in fact the organization is called Year Zero One. We regret the error.